The miniature props seen throughout Perera’s shots are also part of his ever growing collection. Though many miniature items, like magazines and game consoles, can be found on sites like Etsy or eBay, Perera is always on the lookout for local suppliers. Last summer he even managed to snag a few dozen pairs of tiny sneakers on a trip to Hong Kong for a friends wedding. But there’s not always a toy shop or online store that can supply exactly what’s needed for the scene Perera has dreamed up. “I’m actually getting into the habit of making most of my props,” he said. “These days I’m spending more and more time creating props and accessories specifically for each shot.” It may be time consuming to manufacture a few dozen cereal boxes or mold an NES Zapper out of polymer clay, but Perera feels each piece adds a wonderful level of necessary detail to his miniature sets. 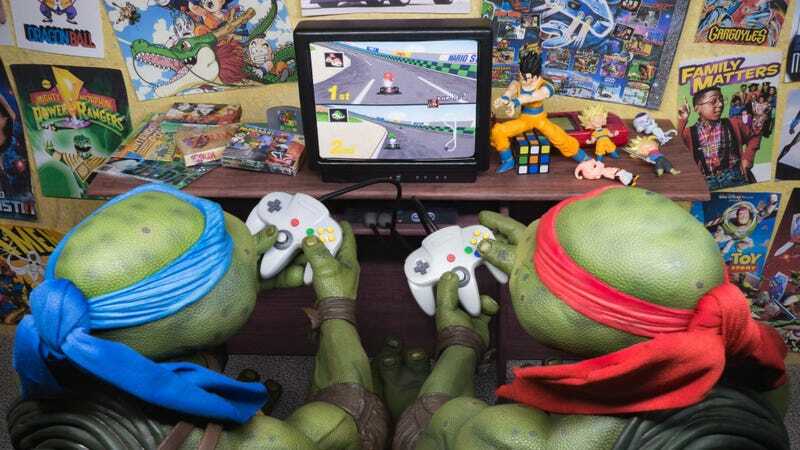 Perera is an avid fan of cartoons, comics, video games, and hip hop from the ‘80s and ‘90s, so it’s unsurprising that the most popular characters and settings from these time periods have been pushed into the foreground of his photoshoots. But anyone can photograph Mario popping out of a warp pipe or Spider-Man hanging from a street lamp. Perera’s photos stand out because he excels at dropping well-known toys into relatable real world situations. “I like to draw inspiration from my life, and sometimes that means going back into my childhood and relieving those memories. Other times, it’s just looking at the scenarios I’m in right now.” Perera confessed he often stops in the middle of everyday activities to think, “Would this make a good toy photo?” These are the moments that lead to surreal scenes such as the Avengers causally browsing vinyl records or Goku in his underwear, ironing his classic orange getup. Nearly a year after launching both an Instagram and Twitter account under the handle Duane Shoots Toys, Perera has amassed over 8,000 followers. Each photo he posts garners thousands of likes, and dozens of comments. As his pictures have spread he’s even started to see some personal requests and commissions roll in. While Perera would love to monetize his toy photography hobby some day soon, for now he’s perfectly content crafting scenes and snapping pictures in his apartment for his own enjoyment.